Founded in 1973, Katahdin Cedar Log Homes is one of the largest log home manufacturers in the U.S. and is the largest processor of Northern white cedar in the world. Committed to helping customers make their log home dreams a reality, they provide high quality cedar log homes at affordable prices. Katahdin needed to revise their existing web site to include more dynamic content and an up-to-date look. The basic requirements for the new site included user-friendly navigation, the integration of applications and many more images. They also desired to improve their image and branding and demonstrate their expertise in an effort to increase visitor traffic. Determining what potential log home buyers were looking for on a web site would be key to generating leads and increasing sales. Extensive consumer and market research had to be performed in order to equip the new site with the ability to convert interested visitors into proud new owners of a Katahdin Cedar Log Home. Overall, the web site needed to portray the elegance and quality craftsmanship of Katahdin Cedar Log Homes while providing a wealth of information about the homes and their benefits -- and how to make the dream of owning one a reality. 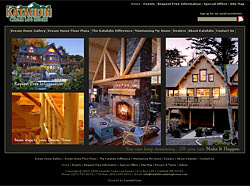 In keeping with Katahdin's request for a site that featured more photos, CrystalVision designed a home page featuring large, professionally taken photos of log homes that relay the same kind of warm, cozy feel of Katahdin's homes. In the bottom left-hand corner, photos rotate and link to a variety of promotions within the web site. At the top, a mini newsletter sign-up form passes along an entered email address to the web site's contact form. The end user then completes a short form on that page and data is submitted directly to the newsletter management tool the company uses to send out email blasts. The header design for the inside pages keeps with Katahdin's wish to feature many large images. Additionally, these images link to the floor plans they are from. If an end user finds an image appealing, they can click on it and will be sent to the image plans gallery to see more images and floor plan drawings. Using XML and Adobe Flash, CrystalVision incorporated several large images into a slide show gallery that loads rather quickly. Unlike most image galleries of this nature, clicking to the next or previous slide does not require reloading the entire web site page, but rather only the single image inside the Flash. Displayed here are results from a search through the floor plan database. 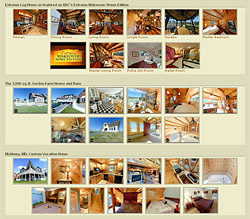 The Katahdin web site features over 500 different floor plans, and within each floor plan is a series of images as well as a list of unique specifications. Users visiting the site can search by square footage, the number of bedrooms, the number of bathrooms, the number of floors and more. Visitors can also control the number of search results returned per page and how those results are ordered on the page. Search results include thumbnail images linked to detailed floor plan gallery pages, as well as a brief summary of each plan's main features, including the square footage, the type of ceiling and the number of additional images available on the detail page. The detailed views of floor plans provide users with additional images and a list of specifications. This view also offers some detailed floor plan specs (including room sizes) and, in many cases, several photos of actual construction. Thumbnails can be either clicked on or moused-over, allowing users can see a larger version of each photo. All information in the floor plan database can be added by Katahdin employees via a back-end control panel designed by CrystalVision. This easy-to-use back-end administrative panel allows Katahdin employees control of several important web site features, including the floor plan database. The administrator can add, edit or delete floor plans as well as their various photos and detailed specifications. 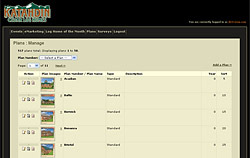 New photos can be uploaded using a simple upload tool. 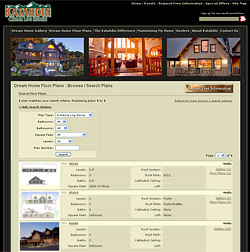 This admin area also allows Katahdin control over the Log Home of the Month feature of their web site, which highlights a specific floor plan, and it allows Katahdin's newsletter manager to create landing pages specific to each Katahdin email blast. The flexibility of its design permits CrystalVision to continue extending the web site's administrative functionality by creating new modules as Katahdin's needs evolve. Dating back to their older web site, Katahdin had a series of 360° I-Pix virtual tours they needed worked into their new web site. The tours are accessible by clicking on a thumbnail image in the gallery which will open a pop-up window with the tour embedded inside. While CrystalVision recommends virtual tours, I-Pix technology is an acquired taste, often requiring end users to download special web browser plug-ins. The somewhat "wall-eyed" final product leaves some viewers dissatisfied. As a result, while CrystalVision can program I-Pix, we recommend shooting more straightforward video tours and encoding them in the immensely popular Flash Video. The final outcome was a newly designed and developed web site that positions Katahdin as the industry leader, offering comprehensive and detailed information displayed within a sleek and user-friendly interface. 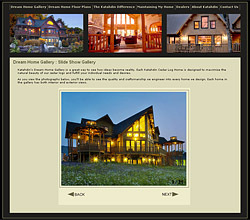 Rich photography and database driven animation provide virtual tours and interactive image galleries, and visitors now have the ability to search a portfolio of more than 500 plans to find ideas for building their cedar log home. 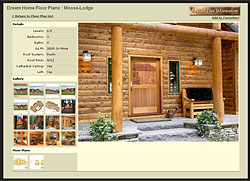 The site offers an abundance of information including scientific data about the benefits of cedar over other materials; Katahdin's "green" approach to manufacturing, as well as the environmental advantages offered by cedar log homes; how to maintain a cedar log home; the ability to locate a Katahdin dealer; and money saving offers, special events and seminars. Future development phases will provide additional features and functionality to the site.